Outfielder Carlos Peguero is a career .195 hitter with nine home runs and 27 RBIs in 219 at-bats in the majors. KANSAS CITY, Mo. 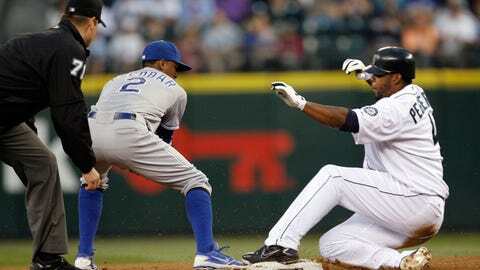 (AP) The Kansas City Royals acquired outfielder Carlos Peguero from the Seattle Mariners on Wednesday in exchange for a player to be named or cash considerations. The 26-year-old Peguero has spent parts of the last three seasons with Seattle. He is a career .195 hitter with nine home runs and 27 RBIs in 219 at-bats in the majors. He ranked seventh in the Pacific Coast League with 19 homers in 2013, along with a .260 batting average, 28 doubles and 83 RBIs at Triple-A Tacoma. Peguero was designated for assignment on Jan. 16 when the Mariners signed free agent catcher John Buck. The Royals also designated left-handed pitcher Everett Teaford for assignment. Teaford made one appearance for the Royals in 2013, pitching 2/3 inning at Cleveland on July 14.